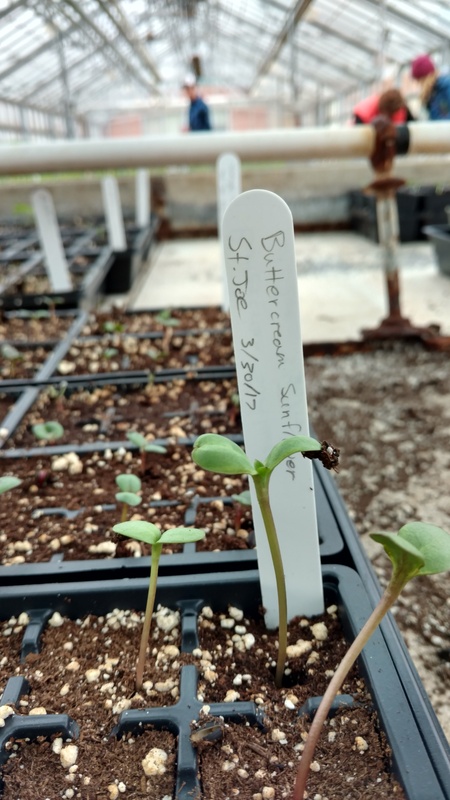 Find out what’s growing at the Farm at St Joe’s! 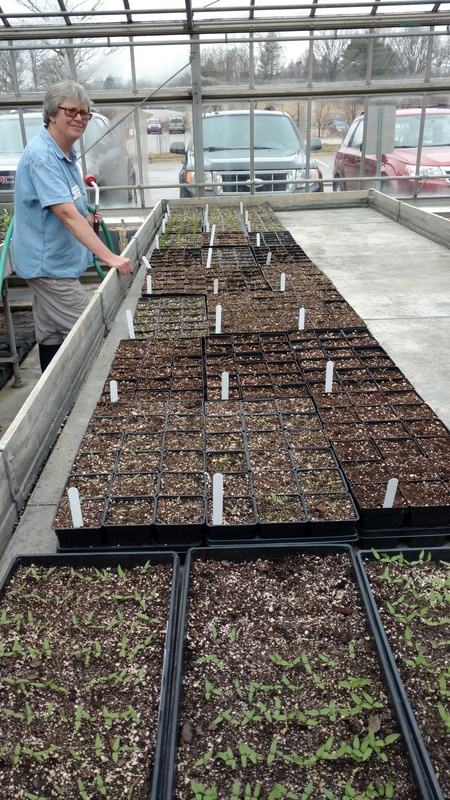 Although plants are grown from seed year round at the Farm in the hoop houses, the spring planting of seeds is a larger production. In a few weeks, the cycle of planting new seeds will begin again. 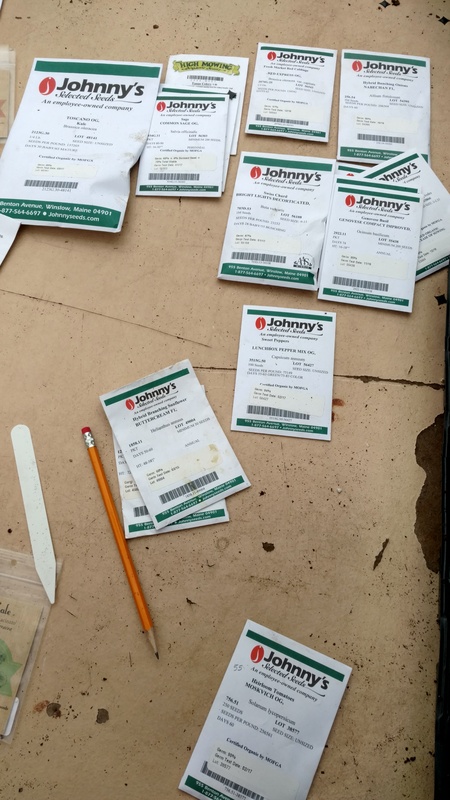 The spring seeds are grown at the Matthaei Botanical Gardens greenhouses. Check back soon for the next cycle of plants from planting seeds to harvest! Below are some of the ripe tomatoes that were grown last summer… cant wait until the Farm has the tomato beds growing again! Amanda and Ginger have been busy sprucing up the Farm with new planting containers. These are butterfly bushes that will have purple blooms. We also have a new wind gizmo! And yes, in case you were wonder, the sky is always clear and blue at the Farm! After stringing up the tomatoes, the heat in the hoop houses has helped the tomatoes grow fast! It won’t be long until you can buy ruby red tomatoes at the Farmer’s Market or CSA share, grown right here at the Farm at St Joe’s. Swiss chard is being harvested from the hoop house for the Farmer’s Market. Amanda calls the Swiss chard the beauty queens of the Farm, because they are so pretty. 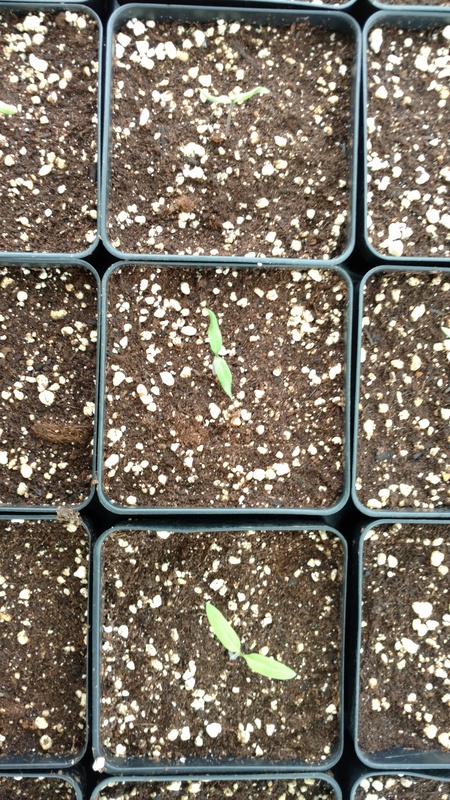 The eggplants are still cruising along growing…. The peppers need to get a pinch bigger, but will be at the Farmer’s Market soon. Carrots and cilantro continue to be harvested for the market. Above, the basil is still growing…and Amanda inspects the Swiss chard and weed situation. The group of volunteers worked out in the field. Previously, other volunteers had prepared the ground, adding compost and aerating the soil. Then Amanda tills the soil and drip lines are added for irrigation. Today we worked on planting red cabbage in the prepared beds for the CSA shares. We added straw, to keep in the moisture and reduce weeds. Here is a bed of onions that is being grown for the CSA shares– this is the before and after I weeded it with another volunteer. What a difference! The white stuff covering the plants protects them from hungry insects. Here Amanda and a volunteer peel back the cloth to inspect the plants and weed. This is kale, in the outdoor field, being grown for the weekly CSA shares. Here we, the group of volunteers and Amanda, the Farmer, worked on stringing up the tomatoes in one of the hoop houses. Tomatoes come in two types: determinate (bush) which are varieties grow to a short height then stop growing when the fruit sets on the terminal bud and then all the tomatoes ripen at once and indeterminate (vine) varieties which never stop growing and slowly yield continuous tomatoes. These are the vine type, which use the string for support to grow to the ceiling. They vine type requires constant pruning to remove sucker branches. The strings are hung down from a wire that runs the length of the hoop house. Then a collar is attached to the bottom of the vine and the string is carefully wrapped around the stem. Kale from the hoop house is being harvested for the Farmer’s Market. These flowers will turn into delicious farm-fresh vine-ripened tomatoes! This is a kohlrabi, below– they are available at the Farmer’s market. Those carrots that have been growing are now being harvested and sold at the market, as well. They are extra sweet and delicious! Below is cilantro and chives that are also available at the Farmer’s market. Cilantro is a staple of salsa and other yummy dishes. Above, the basil that we planted has taken off growing. The dripline is how the plants are watered. Below are the tomatoes. As they grow, they are wrapped around a string for support. Here are the pepper plants nestled in straw to help retain the moisture. That’s kohlrabi next to them. 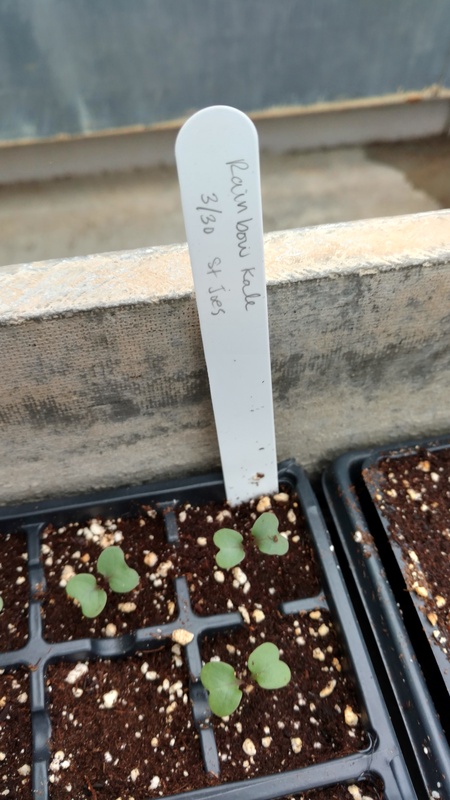 The kohlrabi will be harvested soon and sold at the Farmer’s market on Weds. The kale is being sold at the Farmer’s market (far left). Leaves are picked off as the plants grow upward. The colorful swiss chard will soon be at the Farmer’s market, as well. 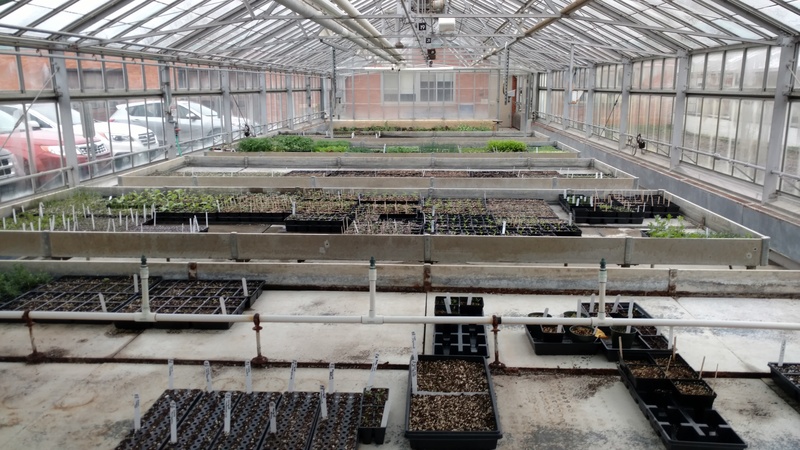 We were pleased to be fortunate enough to continue helping with planting the front hoop house with the seedlings that we started growing at the Matthaei Botanical Garden. Below is cilantro, a herb often used in salsa and other yummy dishes. The drip line beside the plants ensures they get the proper moisture. When the cilantro gets bigger, it will be harvested and sold at the St. Joe’s Farmer’s Market on Wednesdays. The group of Thurs. volunteers spent a lot of time planting sweet lunchbox peppers. These were a big hit last year at the St. Joe’s Farmer’s Market– they are perfect for snacking on. The straw over the beds keeps the moisture in and creates a nature weed barrier. That’s kohlrabi growing next to the row of peppers being planted. To the right and below are those carrots and onions that were planted earlier this spring. The carrots are still small underground, but they will be at the St. Joe’s Farmer’s in a few weeks, as will the green onions (spring onions). 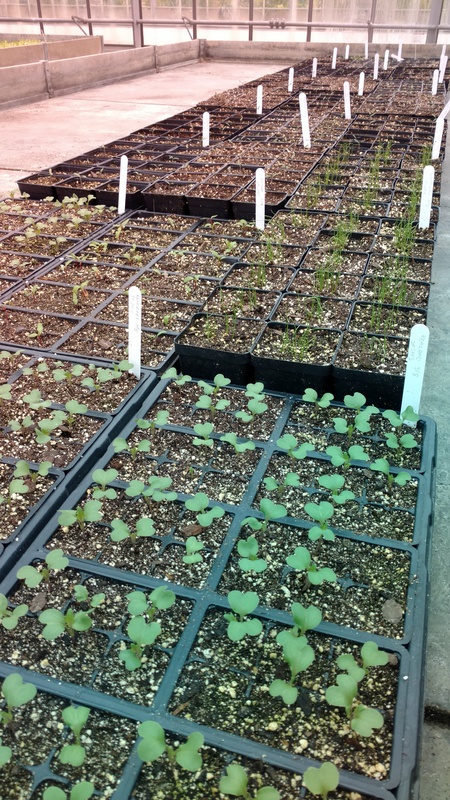 Above- here are the seedlings from the greenhouse, waiting to be planted. That’s basil and onions. Below, there are still white turnips available. Above is Amanda Sweetman, the farmer, holding one of the lunchbox peppers. She’s so happy when the plants are all planted in the hoop houses! Below is a member of our volunteer group planting the peppers. Care is taken to ensure that the plants are spaced apart and staged, allowing the right amount of space for growth and harvesting. Spring is a busy time at The Farm. 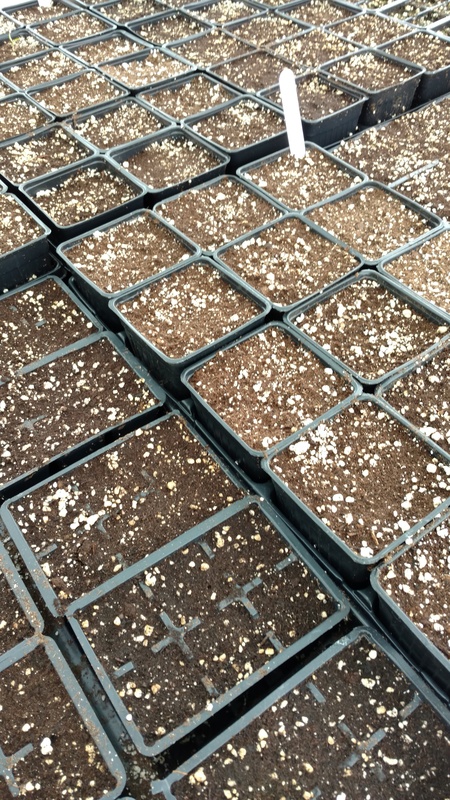 All those seedlings that were planted earlier at the Matthaei Botanical Gardens are ready to be planted. First the beds are prepared with compost, then tilled and aerated. String helps keep the rows straight. 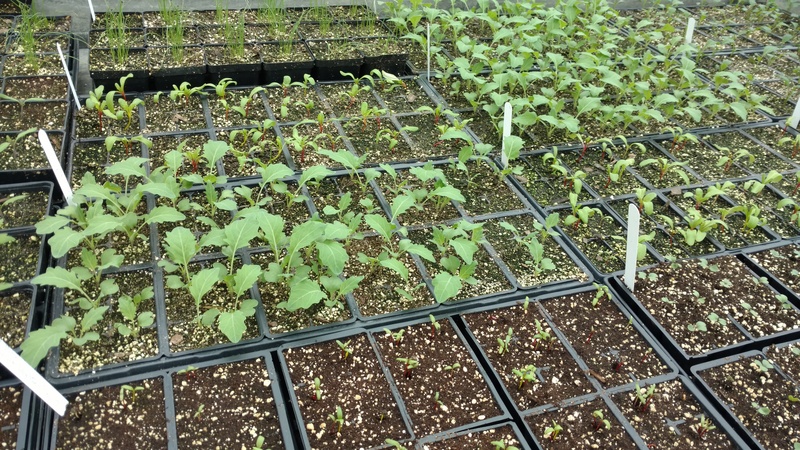 Below, the Swiss chard and kale seedlings are now small plants that we planted in the back hoop house. Our group of volunteers worked on harvesting mature white turnips. The hoop houses are warm, even in the cold spring showers. 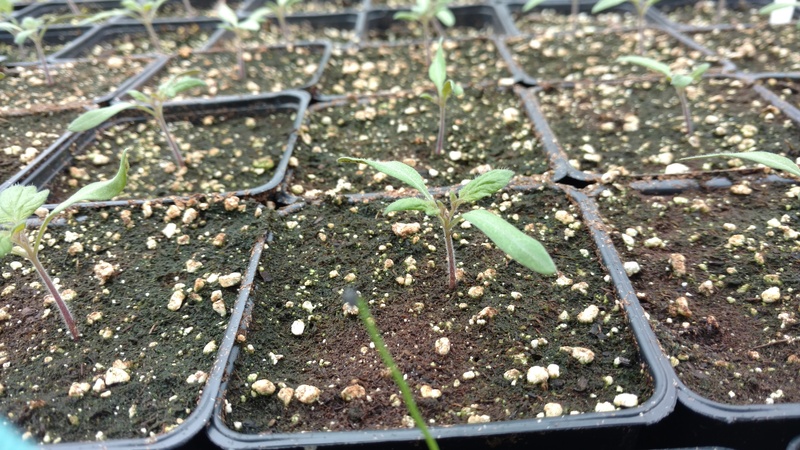 The baby tomato plants are ready for planting–look for fresh, vine ripe tomatoes at the St. Joe’s Farmer’s Market later this year! Drip lines are added after the tomatoes are planted for irrigation. Tomatoes like to be watered from below; this minimizes leaf diseases. 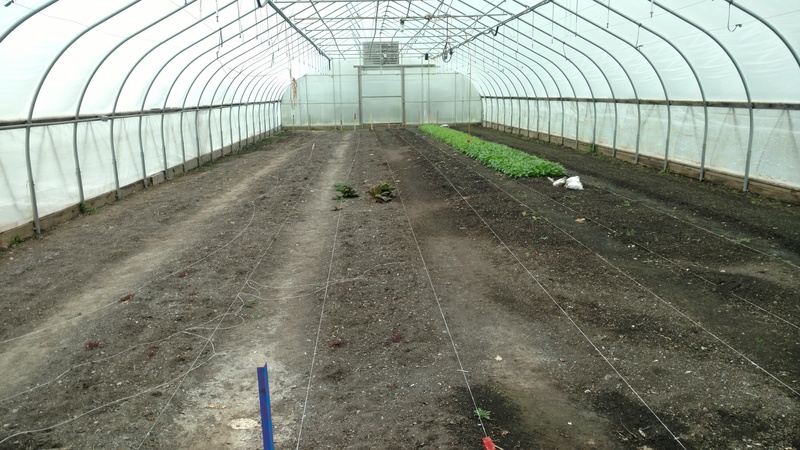 Below are the front of the three hoop houses. The red hoop house on the left is the Eisenhower – St Joe hoop house. 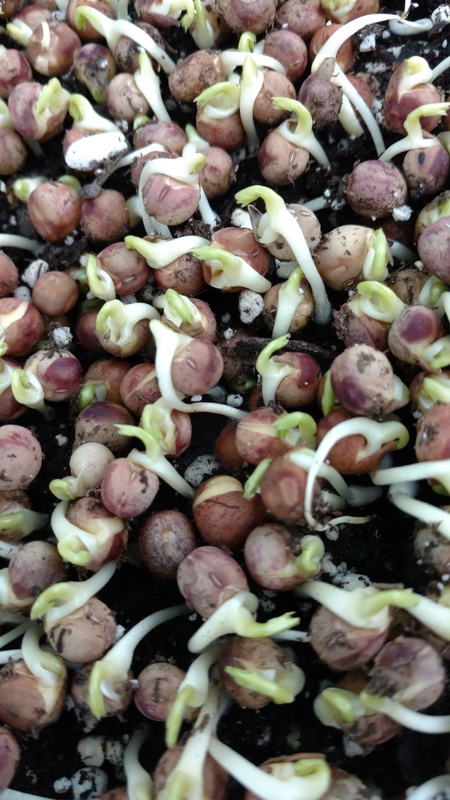 Inside of the Eisenhower hoop house are the peas that were planted a few weeks ago. All of the beds are planted are ready for patients to tend to. Remember those baby carrots and onions that were directly sowed into the front hoop house? Here they are freshly weeded and growing like, well, carrot tops. 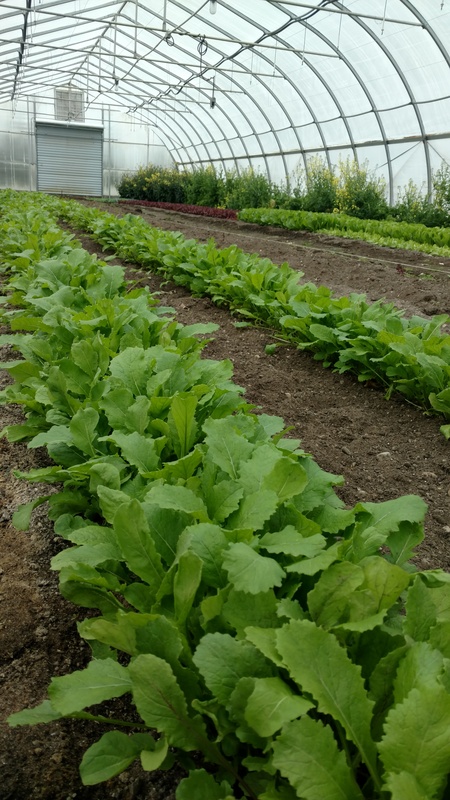 Spring is in full swing at The Farm at St. Joe’s! The hoop house beds will soon be prepared for planting. Above, the hoop houses still let in a lot of light to warm the plants, even on a stormy day. There is plenty of garlic growing at The Farm (below)– this is a field of garlic growing near the hoop house closest to the parking lot. It will be ready in about July or August. This is a compost pile, below, that will eventually turn into rich soil (compost) that can be used to feed the beds. Above is the front of the Eisenhower hoop house, a joint project with SJMHS, at The Farm at St. Joe’s. 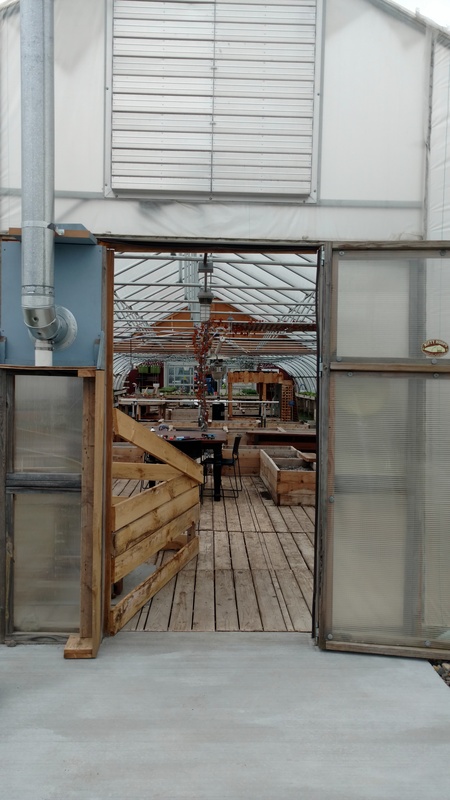 This hoop house features a wooden wall with automatically opening doors, to make it more user friendly for people who use wheelchairs or walkers. 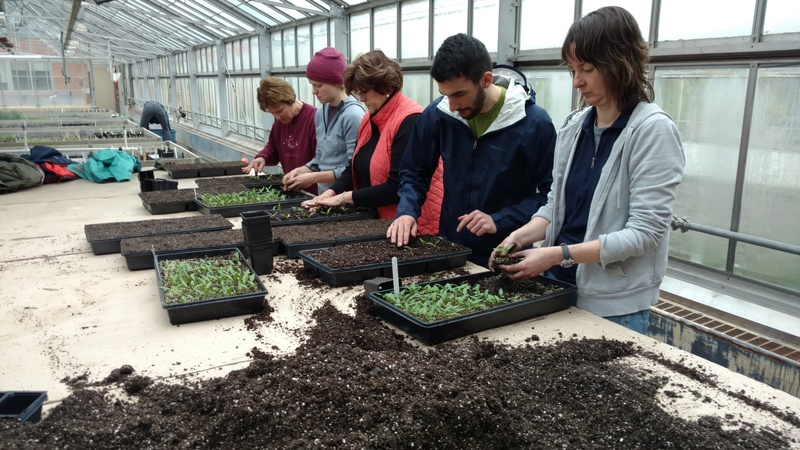 This week our group of volunteers worked at the Farm, while the seedlings that we planted bask and grow in the warm greenhouse at the Matthaei Botanical Gardens. 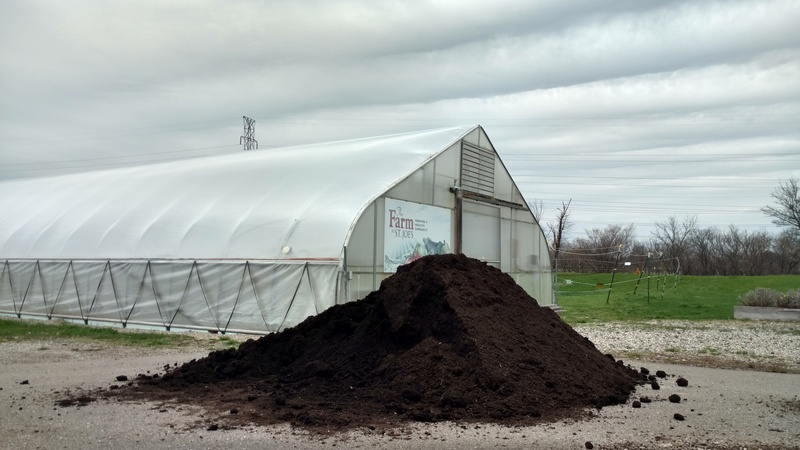 Amanda and other groups of volunteers have been busy getting the two hoop houses empty, so that the soil can be prepared. This compost, below, will be moved by hand with wheelbarrows onto the beds and tilled in, after the beds have been aerated. 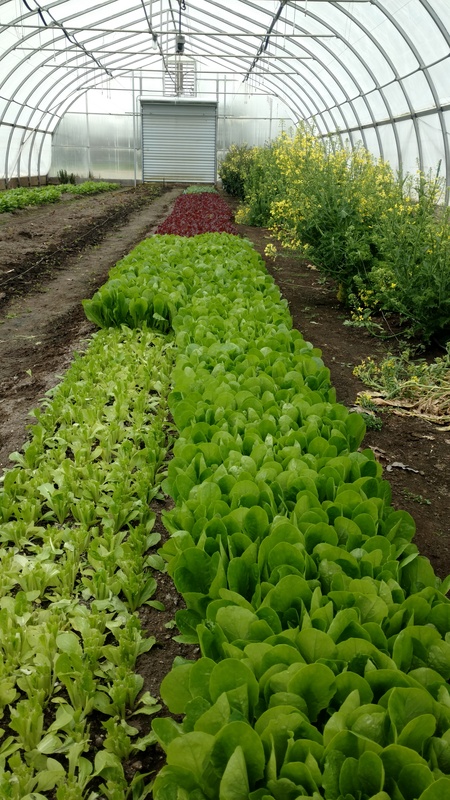 Right now, there are leafy greens growing. For the past few weeks it has been harvested and sold at the Farmer’s Market and given to the Food Gathers for those in need in the community. That’s kale flowering in the far row, below. This field is the Staff Community Garden where some garlic is over wintering. The garlic will be ready in June/July — look for it at the Farmer’s Market. 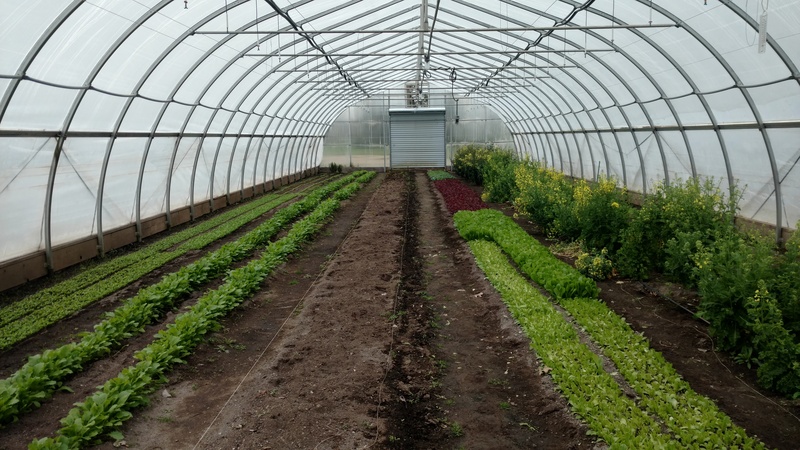 Below is the Eisenhower hoop house at the Farm at St. Joe’s. This is an accessible hoop house for rehabilitation patients. We helped plant some of the beds with young plants. 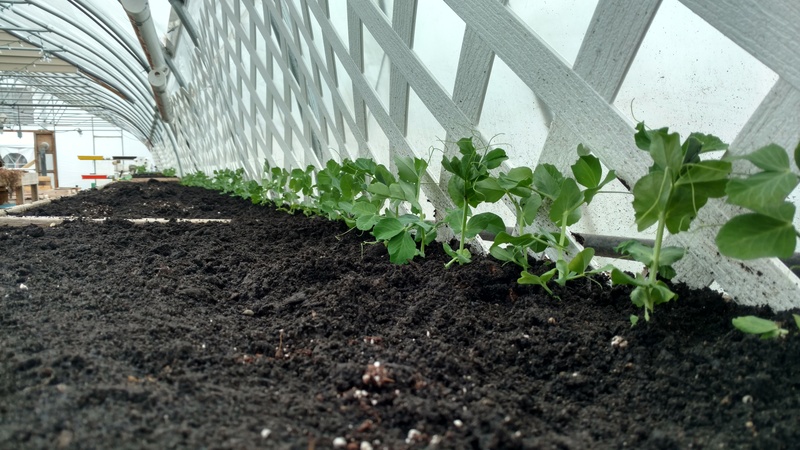 These are peas, below, that we planted in the Eisenhower hoop house with a small trellis for the peas to climb. More vegetables will be added to the beds and then cared for by patients receiving rehabilitation and by people who use wheelchairs. 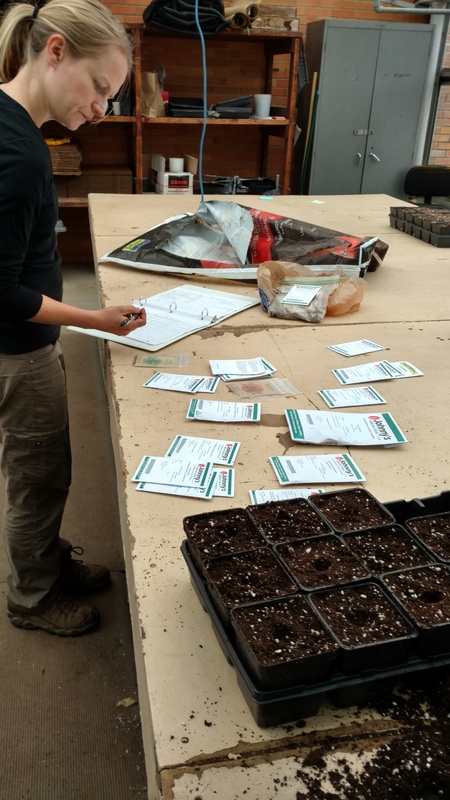 Our small group of regular volunteers went back out to the Matthaei Botanical Gardens to plant the next batch of seeds for the Farm. Staggering the planting of seeds is necessary as seeds germinate at different lengths of time and grow at different rates. 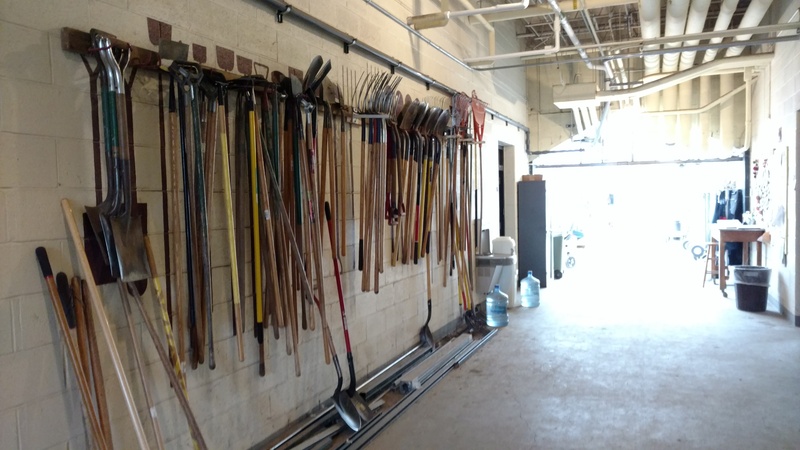 Staggering helps ensure all of the plants are ready to plant in the hoop houses at the same time. 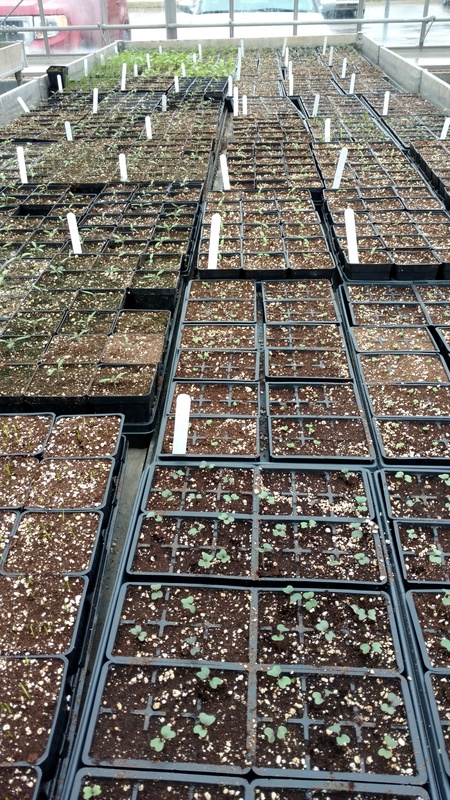 Below are the seedlings that were planted in previous weeks– they are so cute at this age! 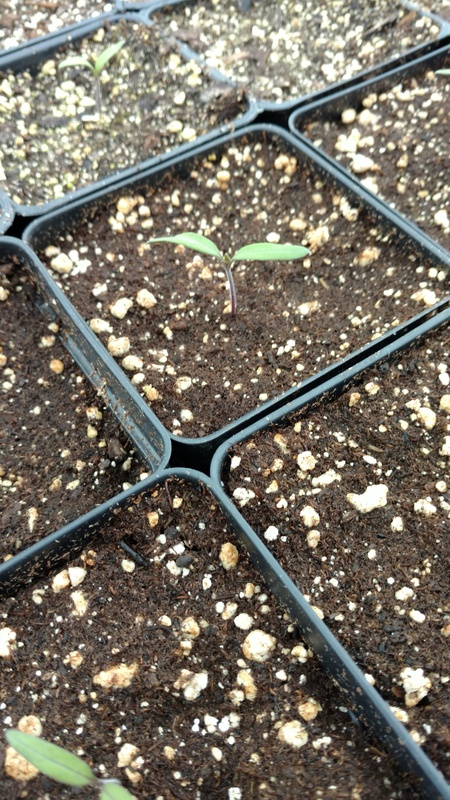 Below, are some baby sunflowers and more peppers. Here (below) are the seeds we planted, as well as more from previous weeks. That’s baby kale, below. 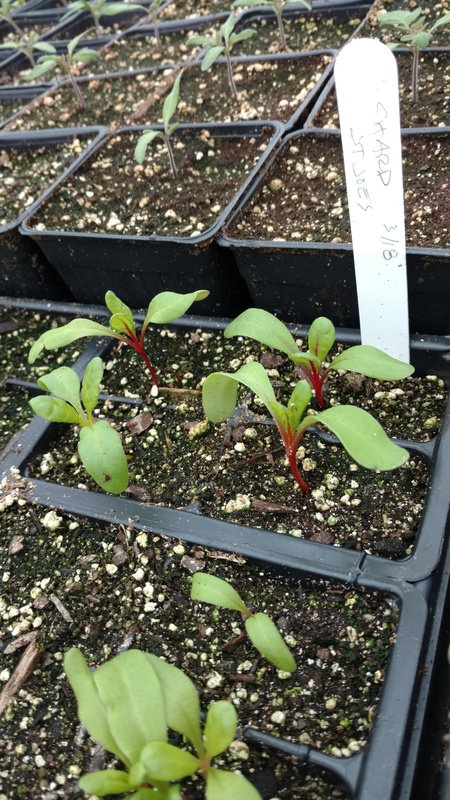 Below is baby chard (middle)– you can tell by the colorful red stems. Here is the group transplanting flats of peppers into bigger containers. The peppers were originally germinated in open flats. 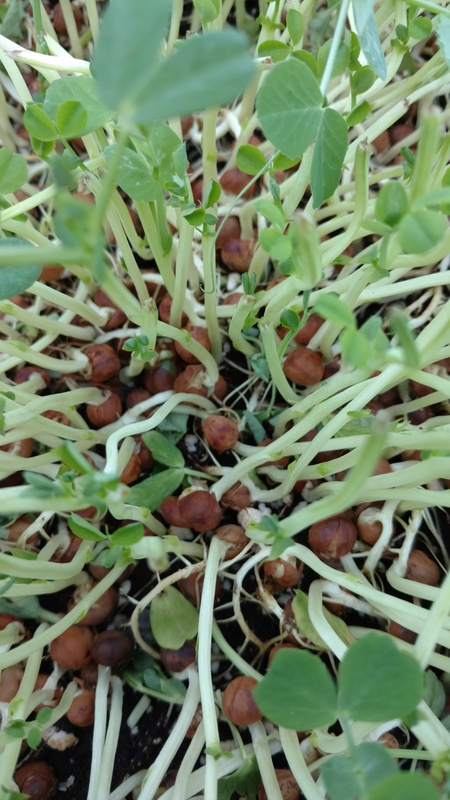 Below are those sprouts from last week! The Matthaei Botanical Gardens is a fascinating place to explore. 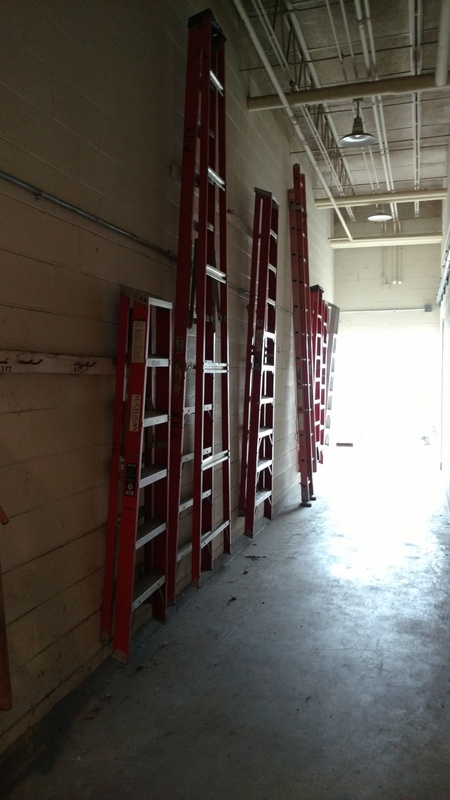 We got to see a glimpse of the behind-the-scene parts of the belly of the complex. The Matthaei Botanical Gardens in northeast Ann Arbor at 1800 N. Dixboro has an amazing conservatory, trails, gardens, a gift shop, and on-going classes and events. 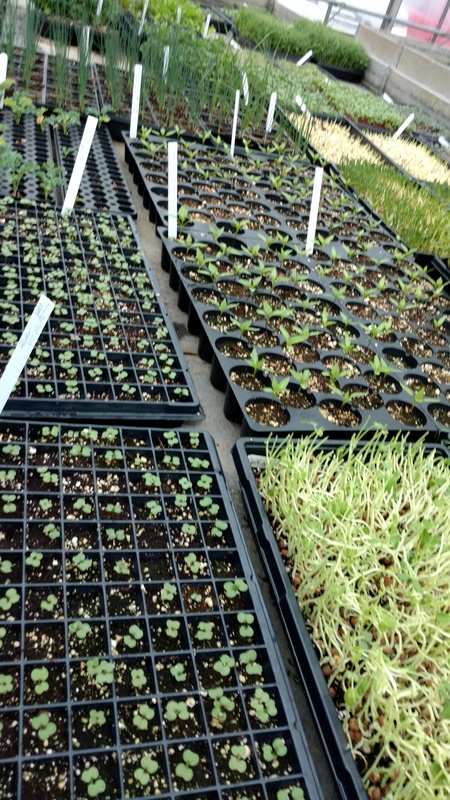 It also offers help getting seedlings growing for local non-profit groups, like the Farm at St. Joe’s. 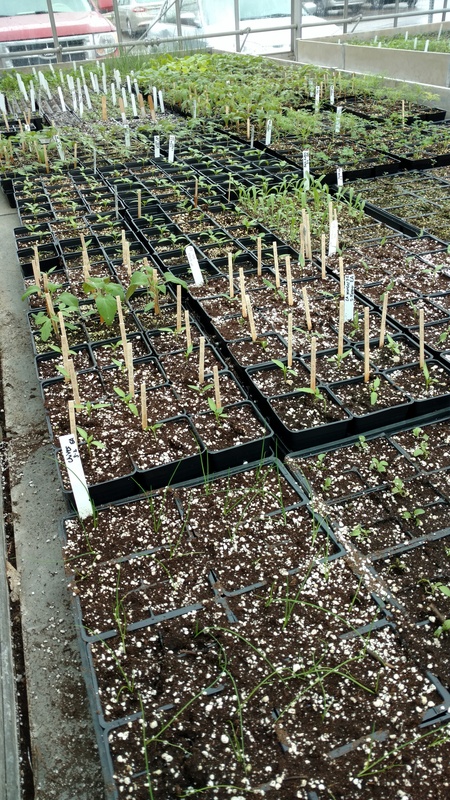 Each Spring, the Matthaei Botanical Gardens generously provides space in their greenhouses, equipped with heated seed germination tables, and provides care for tender young seedlings. 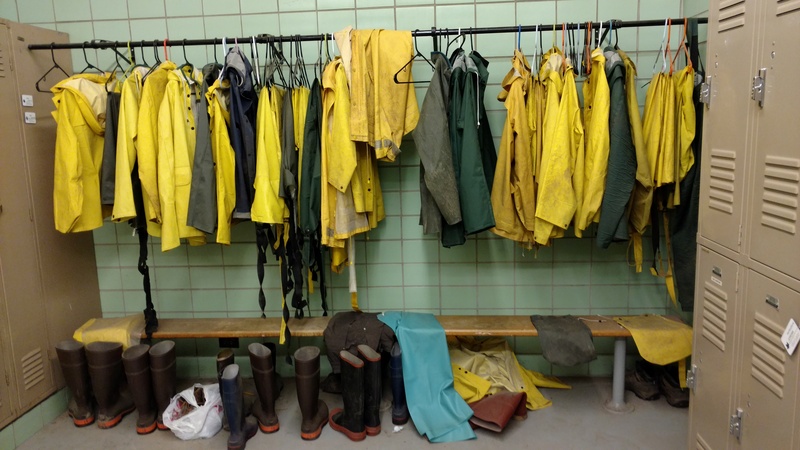 A small group of regular volunteers headed out in a Spring downpour to plant the second batch of seeds for the Farm. 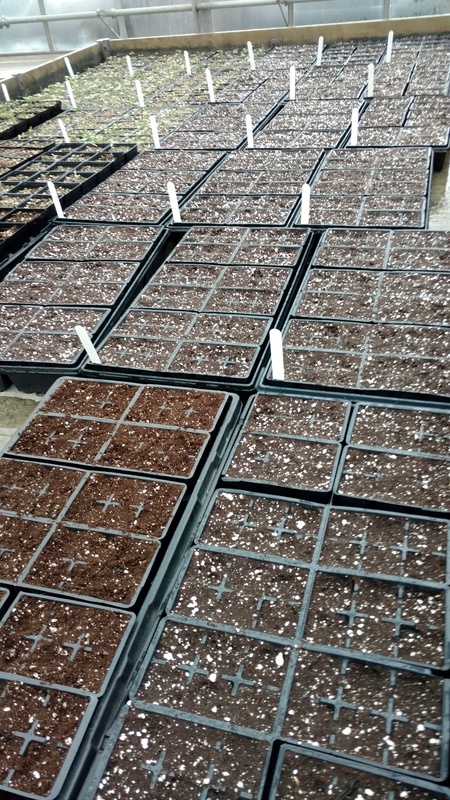 Once the seeds grow into small plants, they will be moved to the Farm and planted in the hoop houses. That’s Amanda (above) recording the seeds into a crop log. Then the fun starts- spraying the soil down and mixing it up with your fingers! 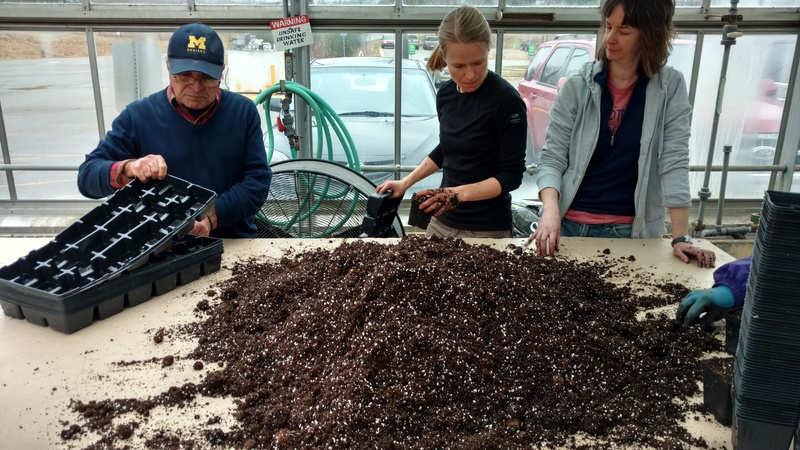 Volunteers help pack the soil into empty containers and plant the seeds. 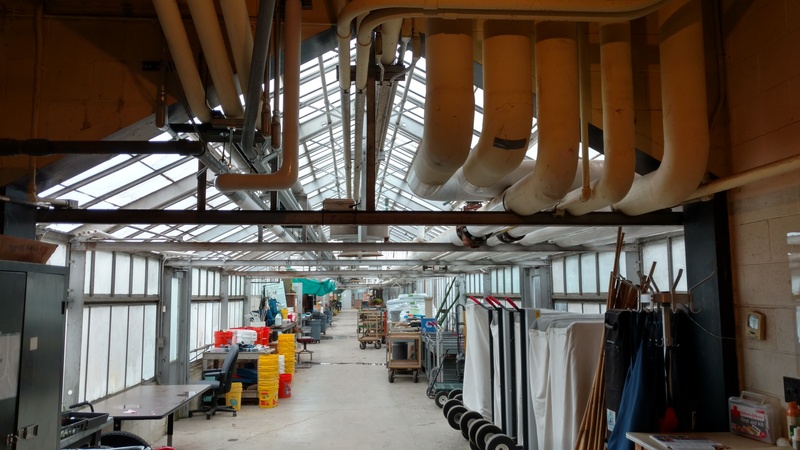 That’s the greenhouse at the Matthaei Botanical Gardens (above) where the seeds are then placed onto heated tables. Above is a gardener of the Matthaei Botanical Gardens who tends to the seeds after we plant them. 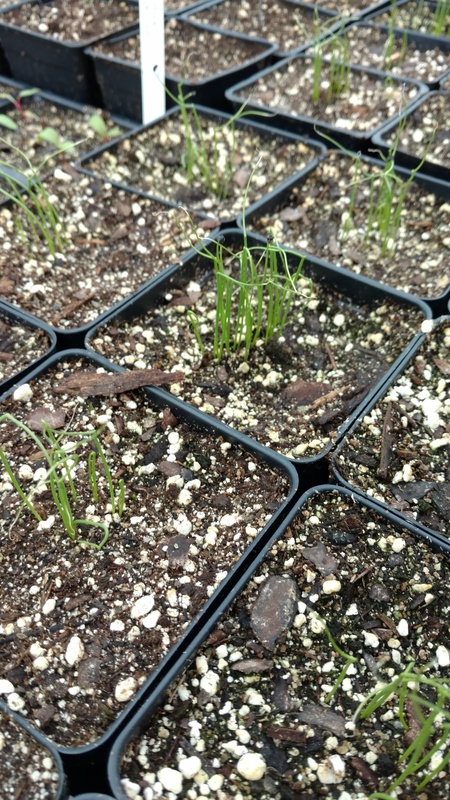 Above are some chives planted earlier that are sprouting. 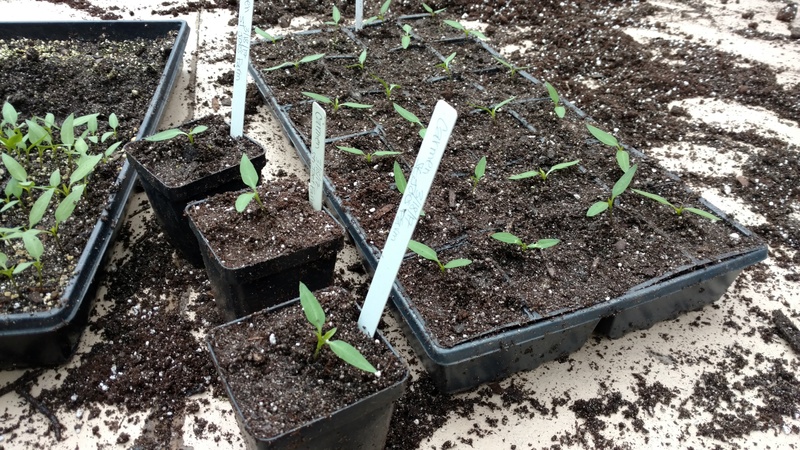 Below are more seedlings planted previously for the Farm at St. Joe’s, including some peppers that have there first leaves. The sprouts on the end are another group’s seeds.